Striking design and standout style define the new Mazda CX-3, the manufacturer’s impressive new compact SUV. Packed with the very best in performance technology, impressive safety measures, and the ultimate comfort features, the new CX-3 adopts a human-centric approach to its design and practicality, thereby ensuring a driving experience that is effortless and rewarding. 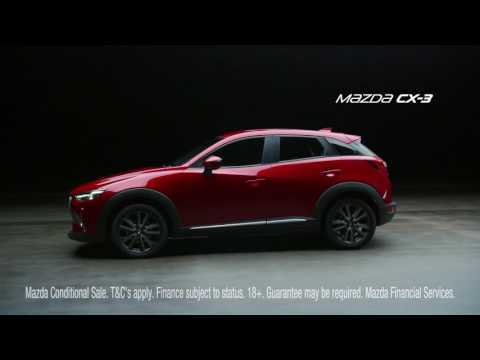 Mazda’s award-winning KODO: Soul of Motion design ethos is widely evident throughout the new Mazda CX-3. The flowing exterior lines convey a sense of continuous motion, with the energy and purpose of the model resulting in an eye-catching appearance. Plus, with dimensions that ensure it makes its presence on the road felt and carefully sculpted angles that evoke a sense of sophistication, you can be confident that the new CX-3 looks every part the contemporary sports vehicle. Behind the exterior shell of constant motion, you’ll find an interior that has been developed for the ultimate driver-centric experience. Carefully arranged controls place all the necessary features at your fingertips - be they entertainment controls or essential performance information. What’s more, the chrome detailing and soft leather trimmed steering wheel ensure that the quality feel of the CX-3 is evident throughout. With ample dimensions to transport you and your family or passengers in the utmost comfort, the new Mazda CX-3 ensures that there is no holding back in terms of quality. Plus, with optional full leather seating available, you can be certain that this compact SUV will provide a relaxing environment in which to sit back and enjoy your travels. Safety is a core concern of any modern vehicle but, in the new Mazda CX-3, the level of protection available is as comprehensive as it comes. With the manufacturer’s advanced i-ACTIVSENSE technology, you can benefit from a suite of intelligent active safety measures that support you throughout your journeys. For example, the Advanced Smart City Brake system monitors the road in slow-moving traffic, using cameras and sensors to help avoid collisions up to 50mph. Alternatively, the Lane Departure Warning system will alert you should you waver from your lane during long and tiring journeys. As you would expect from such an acclaimed manufacturer, the Mazda CX-3’s performance won’t leaving you wanting. The refined driving dynamics of the vehicle ensure smooth transitions and responsive acceleration, while reductions in CO2 emissions and improved fuel economy enable you to travel for longer between trips to the pumps. What’s more, the intelligent SKYACTIV engines - a G 2.0-litre petrol and a D 1.8-litre diesel - have been developed to provide greater efficiency and more torque than ever before. In terms of performance data, the Mazda CX-3 has the ability to race from 0-62mph in as little as 8.7 seconds with the 150ps AWD Sport Nav model. Those looking for better efficiency, meanwhile, will find the 105ps 2WD diesel engine preferable, covering up to 70.6mpg while emitting just 105g/km. Book a test drive of the impressive new Mazda CX-3 by contacting the team at Rockingham Cars in Corby, Northamptonshire today.